Blue Mosque is the place where the land meets the sky in a peaceful harmony. Blue Mosque which is one of the most famous monuments of Turkish and Islamic art is located in Istanbul Turkey. It is at the European part of the city in Sultanahmet area, nearby Hagia Sophia. Blue mosque (its real name in Turkish; Sultan Ahmed Camii) is open to visit every day, just closed during prayer times (approximately a half hour during the each five daily prayers and it is closed for a longer time at midday on Friday, the Muslim holy day). There is no charge for visit but donations for the mosque are requested. Visitors just can enter through the north gate and must remove their shoes at the entrance. Modest dress is required for both women and men; women should cover their heads. In mosques the areas of prayer for men and women are separate; while men pray at the front and centre, women sit at the back and the sides. Sultan Ahmed Mosque is one of the best examples of classical Turkish architecture that you can visit. Its courtyard is the biggest of all the Ottoman mosques and it has more minarets than all other Istanbul mosques. 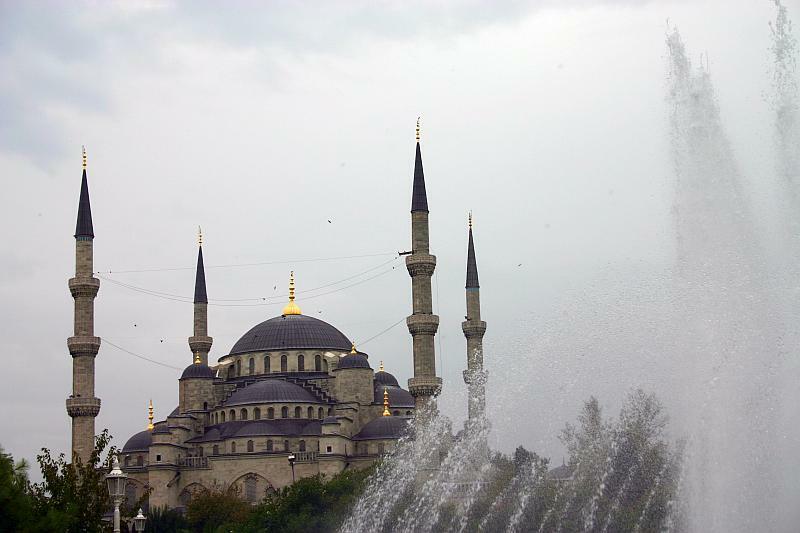 Most mosques have four, two, or just one minaret but Blue Mosque has 6. It is one of the most notable features which are visible from far away. According to locals’ belief, the Sultan directed his architect to make gold (altin) minarets, which was misunderstood as six (alti) minarets. The balconies on each minaret are reached by a spiral staircase inside. In old days muezzins used to climb these balconies 5 times a day to call the Muslims to the mosque for prayers at the proper times. When good Muslims hear the call to prayer, they perform ablution and rush to the mosques. You can view the domes, rising above one another in perfect harmony, over the symbolic ablution fountain in the middle and the surrounding porticoes. The main and side domes rise on four large columns that support broad and pointed arches. The domes (43m high) and 6 minarets are covered by lead, and at the top of the minarets there are standards made of gold-plated copper. Interior part of it is decorated with beautiful hand painted ceramic blue tiles that give the building its unofficial name and 260 stained glass windows. Sunrays stealing through these windows at different angles at different times of the day add color to this beautiful monument. None of the exterior is blue but inside, the high ceiling is lined with the 20,000 blue tiles. The floor is covered by beautiful carpets, as in all mosques. It was built by Sultan Ahmed I, between 1609 and 1616. Because of him Locals call this mosque as Sultan Ahmed Mosque. In 1617 there was a grand opening ceremony and Sultan Ahmed prayed there for the first time. It is the masterwork of Ottoman architect; Mehmet Aga who was a student of the architect Sinan. It's built on the southeastern side of the Hippodrome, on the site of the Great Palace of Byzantium. It is a worthy sibling to Hagia Sophia just a few minutes' stroll to the north. The complex of Blue Mosque consists of bazaars, fountains, Turkish baths, hospitals, medreses, primary schools, tombs and later the tomb of Sultan Ahmed I was added. But unfortunately some of these structures have not survived today. During night times, Blue mosque is covered by a great lighted dome striking light at dark city. Pope Benedict XVI visited Blue Mosque and he really liked it and before he left, he said “I’m leaving half of my hearth in Istanbul”.